DAJOERI offers more than 600 items for sale. Amongst the products are the high-quality, well crafted pan flutes as well as accessory items that make the playing easier. Particularly noteworthy are the numerous music books and our single editions. The publishing house carries a rich collection of sheet music. Most of these items are supplemented with smart CD’s including full-and half-playback. The DAJOERI panpipes are high quality products and are hand-crafted in our studio in Langnau am Albis. In over 30 years of research they have evolved from a simple shepherd instrument to the classical pan flute. Well-known performers, music teachers, students as well as audience appreciate the excellent sound of the DAJOERI pan pipe. The masterful handcrafting makes the instrument also visually harmonious and ensures a long time availability. DAJOERI Panpipes are available in different sizes. The instruments are tuned in G major but by special request can be supplied in any other key. This symbol has a historical significance. It was established in 1997, designed in the birth year of our first Web site. The symbol was then part of our Home Page and embodied the excellence of DAJOERI panpipes. The history of DAJOERI pan pipes however is going back even further. 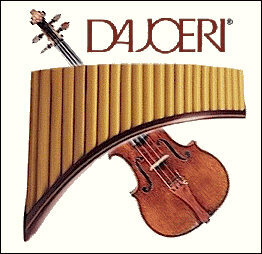 The DAJOERI pan flute school is the oldest in West Europe and was founded in 1971 by Joeri Murk. It provides panflute lessons in Switzerland and abroad for adults and young people and brought about substantial and worldwide dissemination of this wonderful instrument. Our publishing house offers a comprehensive range of more than 500 different articles. This includes more than 30 music books (mostly with solo voice and CD) and over 450 single editions (with piano or organ accompaniment). The CDs of various styles (Full Version and Play-Back) are intended to be a valuable learning tool and are also ideal for individual house music. Reminiscences of our concerts and memorable events of our seminars are available online and on DVDs. At a later stage we will also offer BDs (Blue-ray discs) encompassing full 1080P HD resolution. We also offer various accessories that are assisting you in playing the pan flute and make it ready to play. This includes the highly professional tuning and maintenance tools for keeping the pan flute in good shape. Finally, we also offer jewelry and clothing that carries the symbolic value of the pan flute into and around the world.